DULUTH, Ga.--(BUSINESS WIRE)--Jul. 1, 2014-- AGCO (NYSE: AGCO), a global leader in the design, manufacture and distribution of agricultural machinery and solutions, announced that Richard Markwell, Vice President and Managing Director Massey Ferguson in Europe, Africa and Middle East (EAME), has been elected new President of CEMA, the association representing the producers of agricultural machinery in Europe. Mr. Markwell succeeds Gilles Dryancour (John Deere) who had been chairing the association for the past five years. The official handover took place during the last CEMA Board meeting in Brussels on 18 June. “It is important that AGCO is an integral part of associations like CEMA, driving the way forward for the agricultural industry. 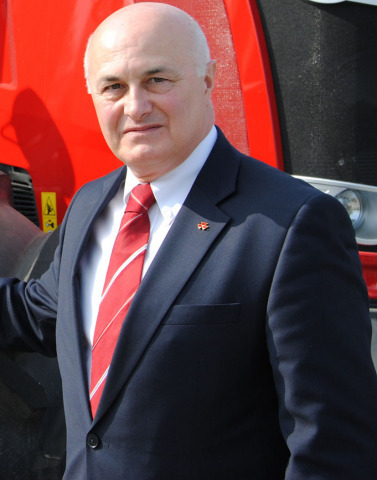 We are very confident that Richard will serve AGCO and the industry well in this position,” said Martin Richenhagen, Chairman, President and CEO of AGCO. AGCO takes the challenge of feeding a growing global population very seriously. Advanced farm machinery solutions are key to solving the challenge of doubling world food production and being able to feed 10 billion people in a sustainable manner by 2050. AGCO is committed to producing equipment and solutions for professional producers working to do just that. The CEMA President is elected for a two-year term and is eligible for re-election once. CEMA is the European association representing the agricultural machinery industry. The industry represented by CEMA includes 4,500 manufacturers of agricultural equipment employing directly 135,000 persons and indirectly in the distribution and service network another 125,000 persons. The companies are mainly small and medium-sized manufacturers according to the EU definition and in 2011 had a total turnover of 26 billion euro.